We boarded our boat, the Emerald Sky to a buffet lunch. It was an opportunity to meet our fellow travelers before being shown to our cabin on the top deck. The cabins are on three decks, with the upper two boasting balconies; the lower deck is mostly below the waterline. On riverboats, a balcony comprises a window that opens into a small area in your room, with a couple of chairs, but it was lovely to feel the breeze on your face. Down the hall from our room was the lounge and bar where we’d lunched. The Sky accommodates 180 passengers and I reckon the nationality split was 40% Brits, 35% Americans, 25% Canadians, and a couple from New Zealand. And, with this demographic, we also had Mr. Brexit and Trump on board; spectres we tried our best to avoid. 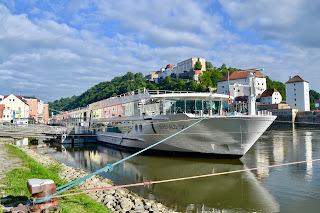 We sailed southeast from Nuremberg to Budapest, a journey of 870 km. I hadn’t realized but, since 1992, it’s been possible to sail from Amsterdam to the Black Sea by riverboat. 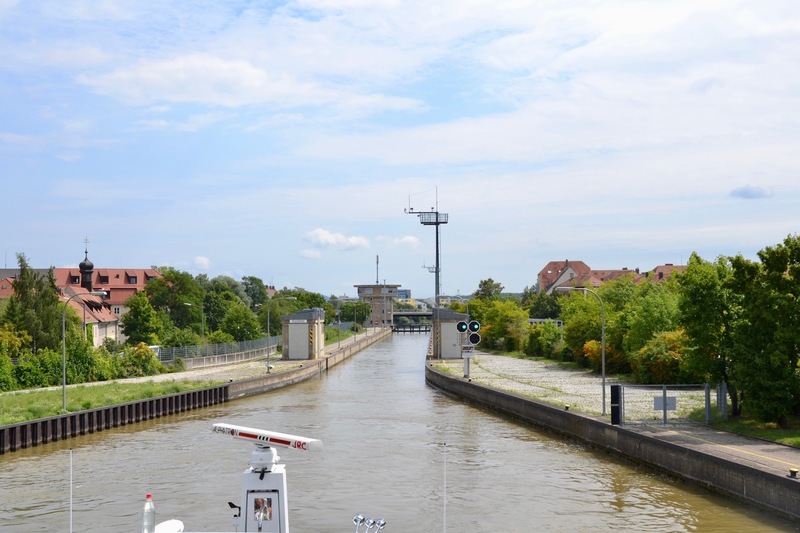 We left Nuremberg, initially along the Main-Danube canal, which flows west to the North Sea, before entering the Danube. 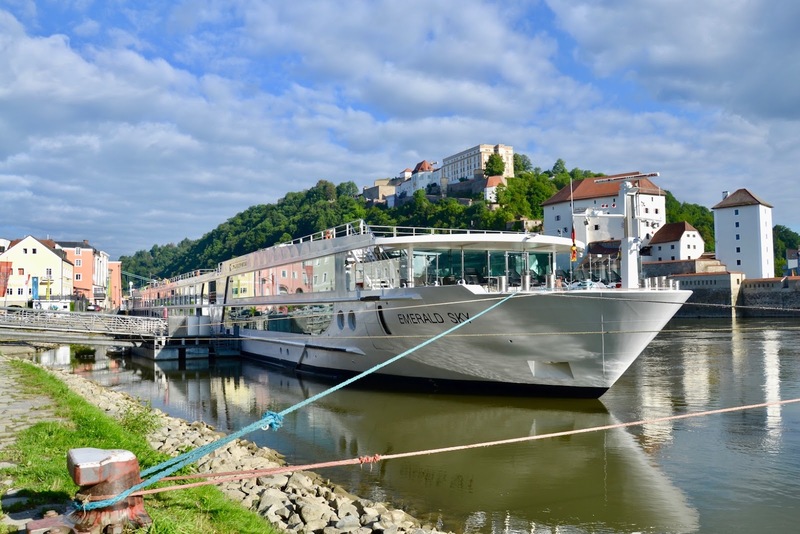 It passed through 25 locks on its way to Budapest – many only inches wider than the boat, it seemed – standing on the prow it was hard to believe we’d fit through. 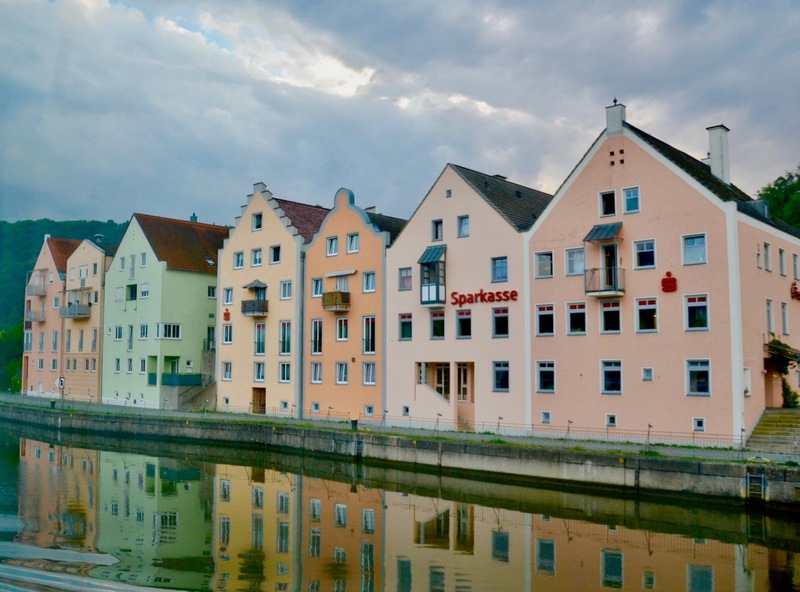 We left Nuremberg at 5pm and docked in Regensburg next morning. In that short span, we’d passed through 9 locks climbing 90 meters (>300 ft) to the continental divide, and then dropping 80 meters (260 ft) on the other side, into the Danube, flowing east to the Black Sea. 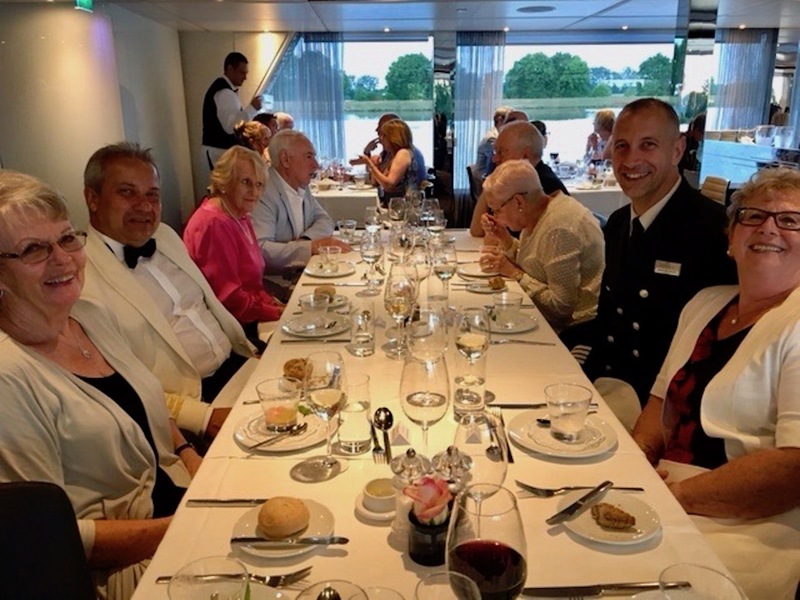 After our first full day we were invited to the Captain’s table for dinner – we dressed our best. Breakfast and lunch were self-serve buffets, but waiters served all of the evening meals, ordered from a menu. All 10 of us were served our courses simultaneously – something to see on a small boat. And the cruise was so smooth you wouldn’t have known you were moving. The ship is a long tube; narrow enough to slide through the locks and, with some tweaking, flat enough to slip under the bridges; and there are a lot of bridges. One afternoon we were laying on the top deck enjoying the sun when the captain announced: “We are going under a low bridge. Everyone must sit down or go below.” The ship’s bridge deck, a box that protrudes from the middle of the top deck, started its descent into the deck. 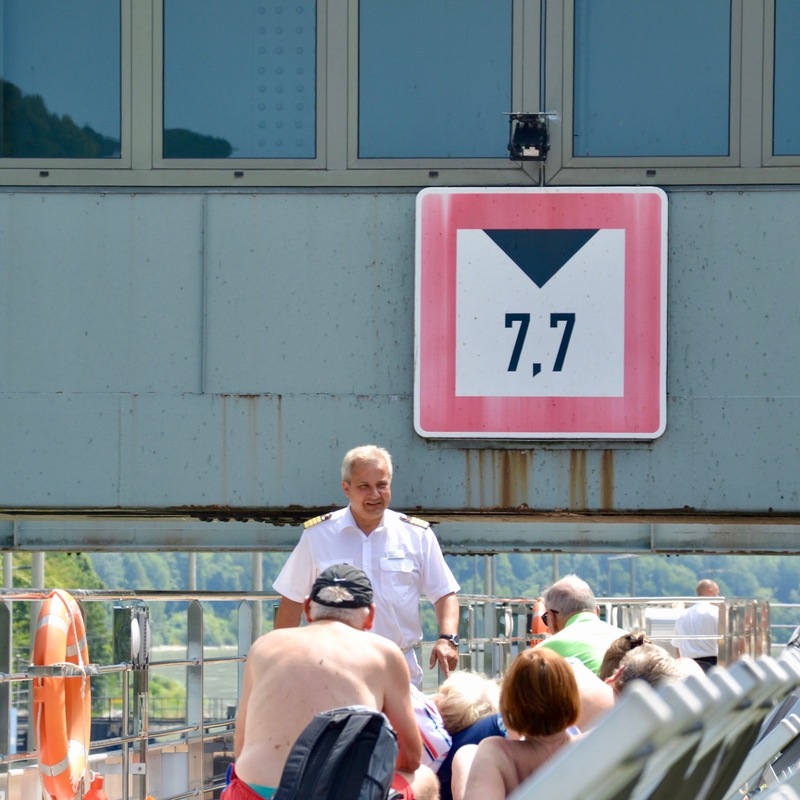 Within minutes, we’d entered a lock and started to pass under a bridge. The captain appeared on deck and slowly walked aft, keeping just inches ahead of the bridge, making sure we stayed down. The bridge passed over us, about 4 ft above the deck. We all looked at each other – in our home countries, the captain would have ordered us all below – we were glad he hadn’t. But, we’d flinched several times, as it seemed the bridge was about to decapitate him! 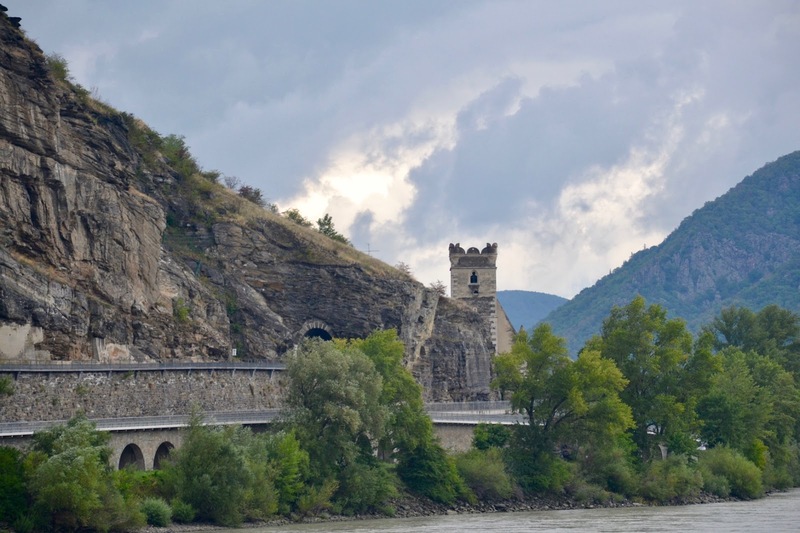 Later, we’d sail down the Wachau Valley, with its castles perched high, churches by the towpath, and sweeping vineyards, as we basked in the >30°C (85°C ) sun on our loungers. Ah, this was the life! The river was flatter in the lower reaches and, for the sportier; you could be put off the boat with a bicycle to ride along the towpath until the next stop, 2 or 3 hours down river. Then, be met by the rest of us, heaping praise, envy, and wonder (at why you would invest in a cruise to pedal instead). Some took the challenge – sadly for them too, it was the only day it rained. We’d traveled the Nile on a 2014 cruise and one evening we’d put on a show. The crew organized it, but it was the passengers who'd had to dress up, play games, and act silly. On this cruise, the crew put on a show for us. 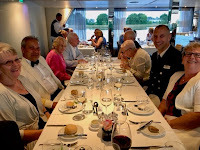 Guys we hadn’t seen came up from the kitchen and sang; the travel director and the maître d’ performed a play; the captain danced with the housekeepers, and then he challenged us to join him – we did. It was a warm and genuine evening. Your words are even more descriptive than the great pictures! Thanks for taking us along. We are doing fine and living in Minnesota. I really enjoy the privilege of reading your travel blogs. We denizens of the New World mostly lack a sense of history (because who has time for that?) but I appreciate history when I bump into it. You take the time and make the effort to highlight the history of the places you visit and that enriches all who read your blogs. Thanks, Boss! Thanks again Jim. All the best.